and far more valuable to us than faith that has never been tested. These past few weeks, while the real world revolves on its' axis... I have been enjoying a visit to the England of long ago. It was especially delightful to re-read The Heart of the Family when I wasn't feeling well for it reminded me that one does not have to be strong or young or rich to bring their influence to the people around them. We know from our first meeting with Sebastian that he is physically weak and soon come to realize he is in the last months of his life. I understand his depression and his feelings of inadequacy. For anyone whose body is no longer strong has moments of frustration, if not depression. However, in this story, as Sebastian's body grows weaker, his positive influence on those around him deepens. The Eliot family will always be better for having Sebastian as part of their inner circle. I also love how the solid rock of the family, while many believe it to be Grandmother, is often the "homely, humble, disheveled, Anglican priest" uncle. He thinks of himself as failing in his role, unable due to physical limitations from WWI injuries to do what I would call "great things". The reader knows that it is in his day in and day out sufferings that he became the rock of faith he is to many. I'm embarrassed to say that as an American Baby Boomer, I assumed it was those people who accomplished great things that most influenced the world. Now I know that real life is lived in small places... in families and friendships and houses and neighborhoods... where God places our sphere of influence for Him. I have found that it is in the quite conversations throughout the years that we can bring our faith and values to others. Most often when our children were growing up, it was those times when we were driving to and from a class or an errand, when hiking a trail or drying dishes, when we were answering a question while folding clothes or stirring soup... the day to day living of people around us... that wisdom was passed on to the next generation. I think if I knew then what I know now, how fast the years fly by and how little time we have with those around us, I would have put more thought into that which I wanted to pass on to others. But God doesn't want us to live life in a rear view mirror. He knows it is in the day-to-day actions taken and precept by precept conversations that we pass on what we have learned. I think of conversations with my mother, friends, and other people who came in and out of my life throughout the years. A few of the people who had a significant influence on my faith were those I knew only a short time, as if God (and I believe He did) ordained the crossing of our paths for that purpose. Their words helping to mold and shape me as much or more than any sermon. For listening to good teaching, excellent books, and especially reading the Bible help to lay a foundation of Truth in each of us. But isn't it true that most Truth... and definitely increased faith... are burned into us through the heat of adversity? When we meet those who have gone through trials and have come out with a deeper love of God and His people... they provide a walking, talking testimony. We have a decision to make as we walk along our journey. Either we will allow God to mold us and shape us as He wants, to be the finished product we are intended to become... to leave a legacy of faith and courage to our family and friends. Or... we will choose to kick and scream and complain our way to Heaven. We will retain our salvation but our legacy will not be what we hoped. I agree. God has given each of us a circle of influence, and it’s our faithfulness to doing what He’s put before us, that matters. You’re a great example of using your blog for influence! What a wonderful post! The world needs more Sabastian-like characters. I hope to read this book soon, thanks to your well-written description here. Thank you for this lovely post, Brenda. I especially love your reflection on Hillary (if I am remembering his name correctly, several years after reading the book), the Anglican minister/brother. In a time when apparently big deeds are so admired, and often coveted, he is a wonderful example of what Eugene Peterson calls 'a long obedience in the same direction' - such an encouragement. Thank you. I think we are often too likely to compare our service to our family and mankind as that of Christ who healed the lame, made the deaf hear and the blind see. And we devalue our service that we do give through love and living life in general. All that we do and all that we are are magnified through the redeemer and we become like him. We need to remember this and not be so hard on ourselves. I believe you will be inspired by Josh Wilson’s song “Dream Small” it says it all and is my new favorite song. That is a charming painting and I like the example of the humble Anglican priest who does small things with great love, which is what we can all do. What a beautiful post, a word I so needed. And nice to know there are still nice blogs around that are lifting and encouraging! (I found your blog through your comment on Posie Gets Cozy.) Thank you! You wrote about this so beautifully. I may have to order the book for I do not remember having read it, though for a time there, I read everything of Goudge’s that I could lay my hand on. Have recently ordered “The Scent of Water” in paperback just to have it in my library. Yes, I will reread it. Since Goudge was well acquainted with depression, I trust her voice. Have a beautiful week. You have surely influenced far more than you know. Love your last paragraph. It's so easy to think because my life is small that my influence is small (or non-existent) as well. I must remember God has a good plan for my life and this is where he has put me for good reason. Use the abilities that I have garnered over years of struggle to bring hope to others. Yes, you are doing a wonderful job of influencing through your Blog, thank you. A sigh of relief comes over when reading other like minds. And that is nice what Karen said in a previous comment about "finding" you through another Bloggers comment section, isn't that wonderful that that's how we connect with others sometimes? I enjoyed your comments on this particular Goudge title since it is often the least favorite of the three books in the trilogy (judging by reviews on Goodreads). I was reading it at the same time you posted this and appreciated your insights. In Book Two (Pilgrim's Inn) Goudge makes the point that the least beautiful members of the family (Margaret and Hilary) are making the most beauty by pouring out their lives for others. I was greatly encouraged by that. Thus says the Lord: stand by the roads, and look and ask for the ancient paths, where the good way is; and walk in it, and find rest for your souls. 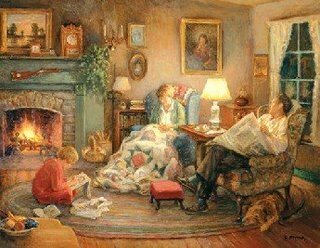 "The ordinary acts we practice every day at home are of more importance to the soul than their simplicity might suggest." Article - What is your food storage dinosaur?